This potent plant has multiple therapeutic benefits and has been used for hundreds of years as a healing plant. It is historically associated with courage and with banishing melancholy. As a tea, a tonic or medicinal herb it relieves stress and speeds recovery. We use borage seed oil in a number of our products because it is a rich, health giving botanical and excellent for easing irritation and redness on the skin, it also nourishes and protects dry skin on the face, and other delicate areas. 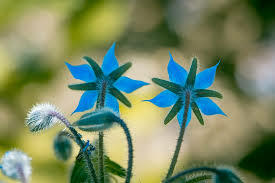 Borage is a cooling, cleansing and curative herb with demulcent (relieves inflammation and irritation), diuretic, expectorant and adaptogenic properties (helps the body adapt to stress). The leaves are rich in vitamin C, calcium, potassium and mineral salts and can be used as a tonic to balance and restore the health of the adrenal glands. The tea is used by herbalists to rebuild strength during periods of recovery, and is of particular benefit after surgery or following steroid treatment. A tea made from leaves and flowers helps to relieve fevers, promotes sweating, and can encourage lactation in breast-feeding mothers. It is a superb hangover cure and an effective remedy for digestive disturbances such as IBS. An ideal winter herb to have around as the mucilage in borage helps to sooth dry coughs, colds and chest or throat irritations. With its many therapeutic benefits, borage (Borago officinalis) is worth nurturing in your garden, and it thrives in even the poorest soil as long as you give it a sunny spot. Slotted between strawberries or tomatoes, this generous plant will increase yield, improve flavour of fruits and encourage resistance to disease in those plants. The delicate, pretty blue flowers are delightful nestled between other colourful fruit and flowers. 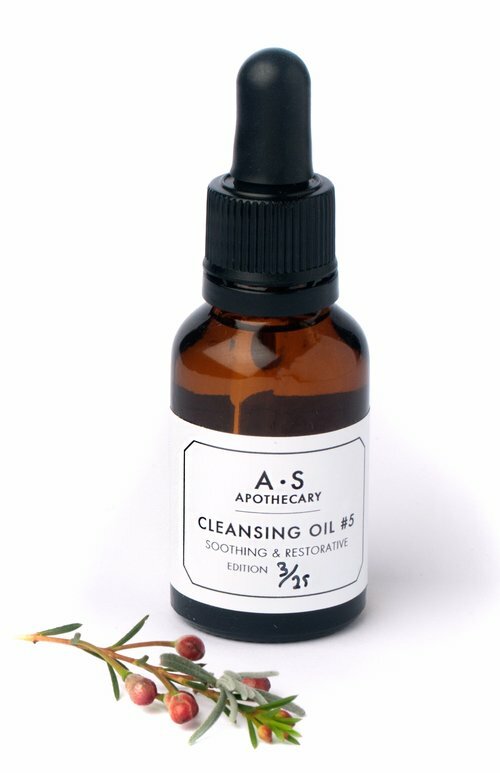 At A.S.APOTHECARY we use the extracted Borage Seed Oil in our Cleansing Oil because it restores moisture, elasticity and smoothness to dry and damaged skin. Amanda wanted to develop a cleanser that was gentle yet thorough enough to cleanse the skin deeply without drying it or stripping it of oils. Borage oil is gentle even on sensitive skin, and can also provide relief to people who suffer from chronic skin disorders such as eczema and atopic dermatitis. It is the richest known source of an essential fatty acid called Gamma Linolenic Acid (GLA), which furnishes it with potent anti-inflammatory and curative properties. The presence of this fatty acid can effectively treat flaky patches and redness in winter and protect the skin from injury and damage. Borage oil also helps regulate water loss which is particularly useful in cold weather and winter months when the skin dehydrates quickly. According to a clinical study cited here, which measured the effects of skin creams containing borage oil on dry or damaged skin, subjects with either dry or surfactant (detergent) induced scaly skin were tested over a two week period. The results showed that the moisturiser containing the borage oil was much more effective at restoring moisture and smoothness to both skin types than the cream that didn’t contain borage oil. Another study published in the ''British Journal of Nutrition'' reported that the topical use of borage oil successfully treated skin dryness and irritation. In winter it's especially important to avoid over invasive or aggressive skin care routines that might further dehydrate the skin, and so choosing a cleansing oil, rather than wipes, a synthetic exfoliator or a cream cleanser is a really good solution. The oil sinks down into the pores as it is massaged into the skin, and when the face is wiped clean with a soft, warm cloth, the toxins are pulled out. The nourishing, smoothing ingredients then remain on the skin and soften and protect it. If you'd like more tips on how to care for dry winter skin, this blog post offers some helpful suggestions.